The key difference between NiMH and NiCd is that the capacity of a NiMH is higher than the capacity of a NiCd battery. Batteries are essential household necessities. Although most of the types of equipment are now directly working with electricity, a lot of other small or portable devices need batteries. For example, alarm clocks, remote controllers, toys, torches, digital cameras, radios are working with the current supplied by a battery. Further, using batteries are safer than using the main electricity directly. There are a lot of batteries under various brand names in the market today. Except for the brand names, we can divide these batteries into various categories according to the mechanism of generating electricity, depending on the ability to recharge or not, etc. 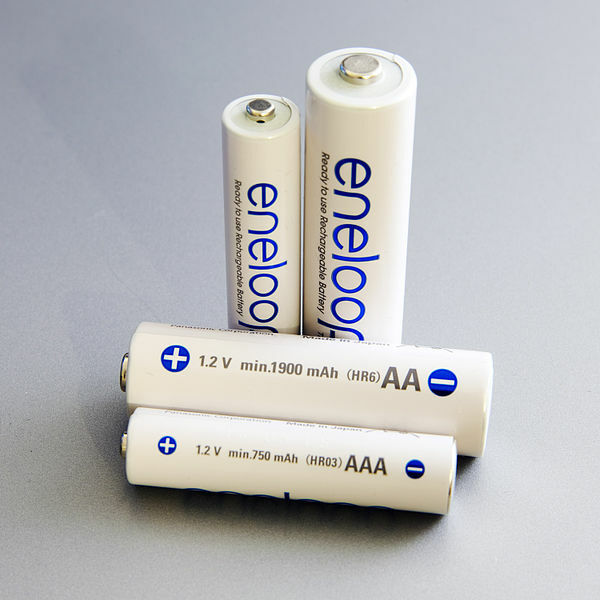 NiMH and NiCd batteries are two types of batteries, which are rechargeable. NiMH stands for nickel-metal hydride. It is a rechargeable battery which was appeared first in 1989. A battery is an electrochemical cell with an anode and a cathode which produces electricity through a chemical reaction. In NiMH also there is a cathode and an anode. The negative electrode of NiMH is hydrogen absorbing alloy, and the positive electrode is a nickel oxyhydroxide (NiOOH). An alloy is a metallic solid mixture which contains two or more elements. When NiMH first came into the market, the alloy that people used as its negative electrode was sintered Ti2Ni+TiNi+x alloys. Later, manufacturers replaced it with high energy hybrid alloys, which we can see today in the batteries of hybrid cars. 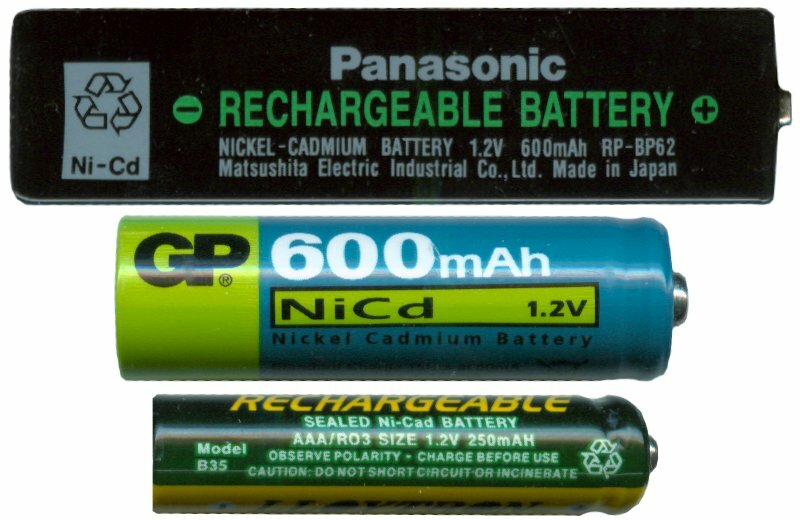 NiMH has a higher capacity compared to NiCd batteries. However, a problem in earlier NiMH was that they tend to lose the charge more quickly. This may be due to the heat produced. And self-discharged batteries require more frequent charging which in turn leads to lower the battery life. 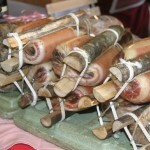 But later people developed more sophisticated batteries, which retains their charge longer. We should supply a voltage range of 1.4–1.6 V/cell when charging NiMH. Normal NiMH battery will have a charge capacity of 1100 mAh to 3100 mAh at 1.2 V. Moreover; we use rechargeable NiMH in more environmentally friendly hybrid cars like Prius, Lexus (Toyota), Civic, Insight (Honda). Further, they are useful in electronic devices, which are portable. This battery is more environmentally friendly and has less toxicity. NiCd stands for Nickel-cadmium battery. The negative electrode of this battery is cadmium, and the positive electrode is nickel oxyhydroxide (NiOOH). Due to the presence of cadmium, these batteries are more toxic. Moreover, we use these batteries often in portable electronic devices and toys. Usually when using a battery pack consisting of more than one cell is used to get the required current. NiCd cells have a nominal cell potential of 1.2 volts. Compared to other acid batteries, NiCd batteries last longer without discharging. What is the Difference Between NiMH and NiCd? NiMH stands for nickel-metal hydride, and NiCd stands for Nickel-cadmium battery. The key difference between NiMH and NiCd is that the capacity of a NiMH is higher than the capacity of a NiCd battery. As another important difference between NiMH and NiCd we can say that the negative electrode in a NiMH is a hydrogen-absorbing alloy, whereas, in NiCd batteries, it is Cadmium. But the positive electrode in both the batteries is nickel oxyhydroxide. Furthermore, NiCd is toxic than the NiMH batteries because of the presence of cadmium. Hence, NiMH is more environmentally friendly than NiCd batteries. 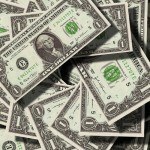 Apart from that, NiMH batteries are cost-effective than the NiCd batteries. The below infographic is a detailed representation of the difference between NiMH and NiCd. NiMH stands for nickel-metal hydride, and NiCd stands for Nickel-cadmium battery. 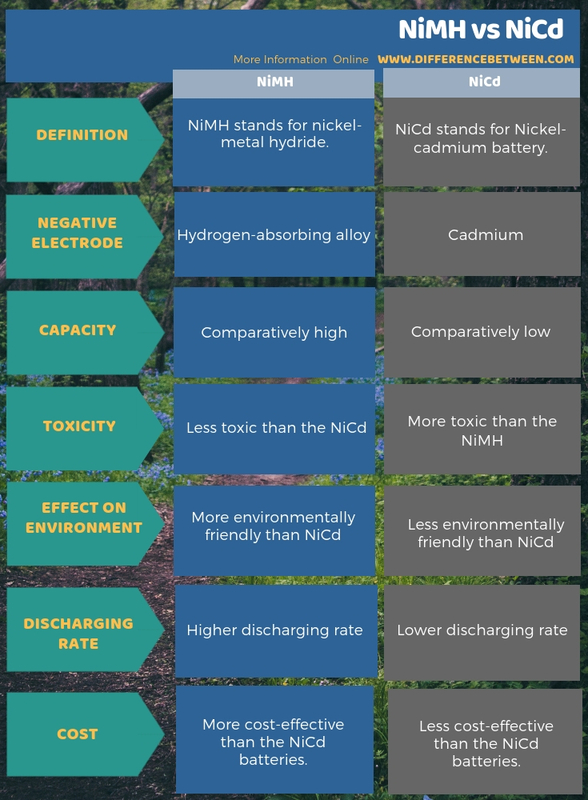 More importantly, NiCd is toxic than the NiMH batteries because of the presence of cadmium. Hence, NiMH is more environmentally friendly than NiCd batteries. However, the key difference between NiMH and NiCd is that the capacity of a NiMH is higher than the capacity of a NiCd battery.